I've had several questions come in via email and comments and thought I would address some of them here to reach the masses. It is just easier on me to reply once, here, instead of answer the same questions over and over again! Did you bank Kate's cord blood? Can she use her own cord blood? No, we did not bank Kate's cord blood privately. We worked with a donation program through MD Anderson. I am currently trying to figure out how to deal with that situation. I feel horrible that someone may have received Kate's cord blood seeing as it is genetically defective. However, even if we had banked Kate's cord blood, she would not be able to use it. One of the biggest myths (and reasons why we didn't privately bank) is that your child's cord blood can help them. Very rarely is that the case. Kate's issues are genetic, meaning her body does not have the capabilities to create platelets. Her cord blood is the same way. We need another individuals healthy bone marrow to cure her. Pray for our family. Pray for healing for Kate. Pray for strength for Alex and I. Pray for me as I will be trapped in a small hospital room with Kate for weeks in isolation. As of now, there is not a lot that anyone can do to directly help us. We know that we will need help once Kate starts chemo, has her transplant, and comes home. But, right now, we are doing a lot of waiting around. One way that people can help anyone currently waiting on a bone marrow donor is to register with the national registry. We are working with DKMS Americas for a bone marrow drive in Ocala, FL (where my sister lives). Kate will be featured as a drive campaign in the coming weeks. There is also talk of drives in Houston, TX as well as Lafayette, LA. We will keep everyone updated with details as they become available. At this time, there is no way to be specifically tested for an individual. The point of the national registry is to help the general public when a need arises - not to join momentarily for a friend/ family member. I can only imagine the heart break that comes with thinking you have a donor only to find out that the donor is not actually willing to donate to anyone other than someone they know. I would hate if someone joined the registry specifically for Kate and then put another family in this situation. Please think long and hard about your commitment before registering. I've heard stories of people sitting on the registry for 15-20 years before being called to donate. If you feel led to join the registry, thank you! If you do not, we completely understand. No, Kate does not have cancer. She has genetic bone marrow failure. However, the bone marrow transplant process is the same for cancerous and non-cancerous patients. I've always wondered when it became acceptable to ask about a women's reproductive decisions. But, apparently lots of people are curious about this. At this time, Alex and I have decided that we will not have anymore children. There are several reasons why we have made this decision. If we ever change our mind, we will have to do invitro fertilization (which is how we got pregnant with Kate after a very long struggle with infertility) with genetic testing of our embryos to screen for CAMT. This process is very expensive and given my health issues, would not give us very good odds of succcess. I am really struggling with this and ask for prayers that my heart comes around to being the mommy of just one child. What is the timeline for everything? How long will the process take? We aren't really sure. We should know more within the next 7-10 days. Since Kate is not critical right now, we have some time to wait for the perfect match. That may change in a month if her condition takes a turn for the worse, but for now, we can be very selective when it comes to finding the right donor. We will not start conditioning (prep work, chemo, etc) until a donor has been identified and agrees to donate. Kate's hematologist has told us that once a donor is identified, we can plan on about two months of prep work before transplant. So, at the earliest, we would be looking at at September transplant. After the transplant occurs, we will have several big milestones to reach - 100 days post transplant, 180 days post transplant, 1 year post transplant. I will explain these milestones as we get farther along in the process. How long will Kate be in isolation? Again, we are not sure. The BMT unit at Texas Children's allows all of the BMT patients to interact with each other. So, we will be isolated to the unit, but not isolated into a room during our entire hospital stay. It is my understanding that visitors will not be allowed while we are living in the hospital. Once Kate comes home, we will not allow any visitors inside the house for at least 6 months, possibly longer. It is just not worth it to Alex and I to chance someone bringing something into our home and getting Kate sick as sickness causes all kinds of issues in transplant patients. We hope everyone understands this. We have also started partial isolation already. We need Kate to be as healthy as possible right now and keeping her inside our home is the easiest way to ensure we are limiting her germ exposure. I apologize in advance if we seem anti-social, we are just doing everything we can to promote a successful transplant. I think that covers the popular questions! If you have any other questions, feel free to leave them in a comment and I will answer them to the best of my ability. I will not answer any question that are negative or have negative intentions. And, I will not publish comments that are nasty, rude, and downright disrespectful (yes, they have been coming in - apparently is it attack the mom of a sick kid week in the blog world). I want to remain as transparent as possible during this process in hopes of raising awareness and being a resource to future transplant mommas who are facing this scary reality. I am thankful for those who have documented this path before me and hope I can do the same in the future! Thank you for taking the time to answer these questions. I have been thinking a lot about you, your husband and Kate lately. I am so sorry she is going through all of this and I cannot even imagine what this must feel like. She is so lucky to have parents like you that are doing everything possible to help her thrive and move forward. Although I know it must be so hard you are doing an amazing job and know that so many people are thinking and praying for Kate and your family. I am praying for your family and your adorable baby. I know that you do not have an easy road ahead of you, but it seems like you have a fantastic online and irl support system. God bless! Thanks for the information. Kate and your family have been in my thoughts for awhile. I can't believe people have made cruel comments to such a sweet baby. Sorry you have to deal with that. As always, praying for your family. Please tell me none of my comments have come across rude!?! I haven't heard back from you in awhile (which I totally understand) but I also hope that I didn't offend you in anyway. I know how things can come across via email/text/blog etc. AND I think it's so amazing that you are answering these questions when you totally don't have to! Shows your strength mama! Thank you for posting this. The best persons are the educated, which makes us more empathetic to the situation. Hugs to you and your family and praying daily! Thanks for posting this. I do want to learn more about it- i guess I feel like I could pray better for her, kwim? Thank you for answering all these questions! As always, lots of hugs to you guys and lots of prayers. Thank you for the answers. Please know that you have all my prayers. Lots of support to you and your family! I commend you for being so open about the journey you're about to embark on. Your family is very brave. I am continuing to pray for you, Alex, and Kate. I learned a lot from reading this! Thanks for taking time out of your super busy day to share with us. Thinking and praying for you guys daily. Let me know if you need anything. You and Kate are in my prayers. I hope you get your angel donor match soon. My heart breaks for you and your family, but little Kate is so lucky to have a Mommy like you!! Stay strong, mama. My heart literally aches for you & your family. I can't even begin to imagine what y'all are going through & will be facing in the near future. I am CONSTANTLY thinking about you & praying for sweet baby Kate. She sure is strong! i just happened upon your blog and will be praying for your little kate. I just had the chance to visit your blog for the first time since we became twitter friends (@ablansford0620, just in case:)) Thank you for sharing all of this information, I can imagine how vulnerable you feel right now and putting this all out there cannot be easy. 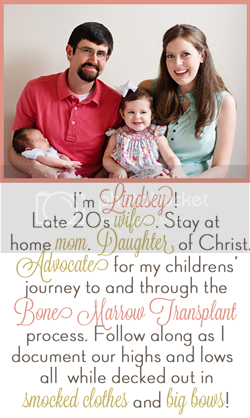 This really makes me want to look more in to becoming a bone marrow donor. I truly think of and pray for you, Alex, and Kate every single day. So thankful that you and Alex have your miracle Kate!! I pray for your courage, endurance, and peace. Know that you have many friends in Mississippi who are loving you three and praying for all of you! Praying for Kate and your entire family. Just wanted to let you know that I will be praying for your beautiful Kate, as well as, you and your entire family. Lindsey...our entire family is praying for Kate, you, and Alex as you triumph over this disease. There are hundreds of others in/around Brandon doing the same for this sweet miracle child. We all believe that with God's help and your strength and determination, you will all come through this successfully. Know that we are following your progress and helping to fight for Kate through lots of prayers. I can't believe people would post something rude about this situation. Some people are just ridiculous. Many prayers going out to you all! Thinking of you and your family and sending many good thoughts your way. I am so sorry that you have to deal with this right now. I really hope they find a donor for Kate ASAP. I admire your courage and class during such a difficult time. I am here. Whatever you need! XO! Thank you for answering all of these questions. We'll be thinking of you.